We are pleased to offer this substantial and well presented six bedroom detached house, with accommodation arranged over three floors, situated on a quiet and exclusive road in Roehampton. The property boasts a bright kitchen/breakfast room, ample entertaining space, a stunning master bedroom suite, five further bedrooms and a separate summer house. Set behind secure entrance gates with parking for several cars, the property is within minutes walking distance of the wide open spaces of Richmond Park and the Bank of England sports ground. Roedean Crescent forms part of an exclusive residential development of substantial detached houses, each standing in large grounds and situated on the edge of Richmond Park adjacent to Roehampton Gate. The development was created in 1939 from the original grounds of the Templeton Estate and were described at their launch as “substantial family houses within 5/6 miles of the Metropolis“. Roedean Crescent is conveniently located close to many sports clubs, including The Bank of England Sports Club and The Roehampton Club. The closest stations are Barnes and Mortlake, which in turn, provide links to Clapham Junction and Waterloo. Roehampton is also renowned for having popular schools in the vicinity, such as The Alton School and East Sheen Primary School. Approached through wrought iron electric gates, opening onto a mono block carriage driveway, with parking space for several cars. The solid front door opens onto the spacious hall/reception room. This is a large and welcoming hall, with the attractive central ornate open tread staircase leading to the first floor taking centre stage, and a fireplace on one wall, flanked by two built in bespoke base units with wall mounted shelves above, creating a focal point around which a seating area would work well. There is a range of built in bespoke cupboards on opposite wall, as well as a guest cloakroom located at the front of the property. The kitchen/breakfast room is accessible from both the dining room via a pair of French doors and from the entrance hall. The modern range of wall, tall and base units, backed with a glass splash back, provide ample storage space, and also comprises an integrated range of Gaggenau appliances, to include a stainless steel fridge/freezer with an integrated wine cooler, a gas hob with extractor hood above, built in oven, microwave steamer, warming drawer and a coffee machine. There is also a central island with an integrated breakfast bar providing space for 4 stools. This is a bright room with light filtering through from the wide skylights and the many glazed internal doors. 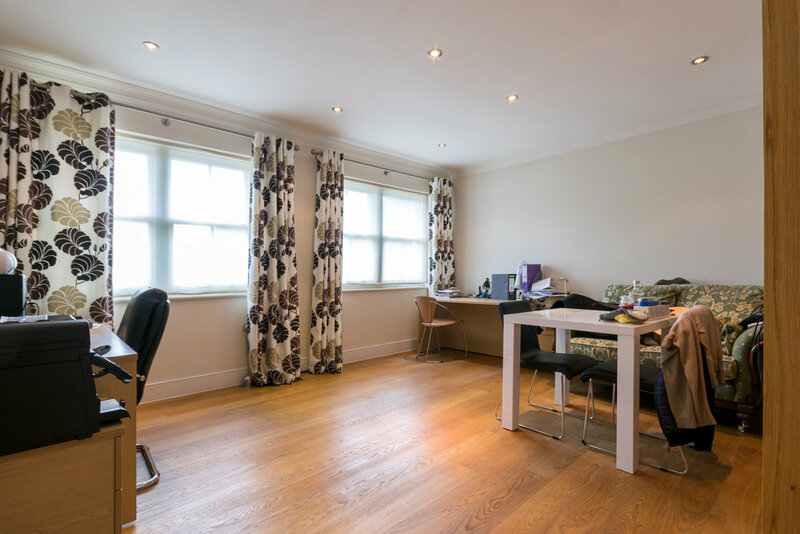 Through the kitchen, a door leads to the boot room, which is well equipped with a range of base units and has access to the rear of the property. 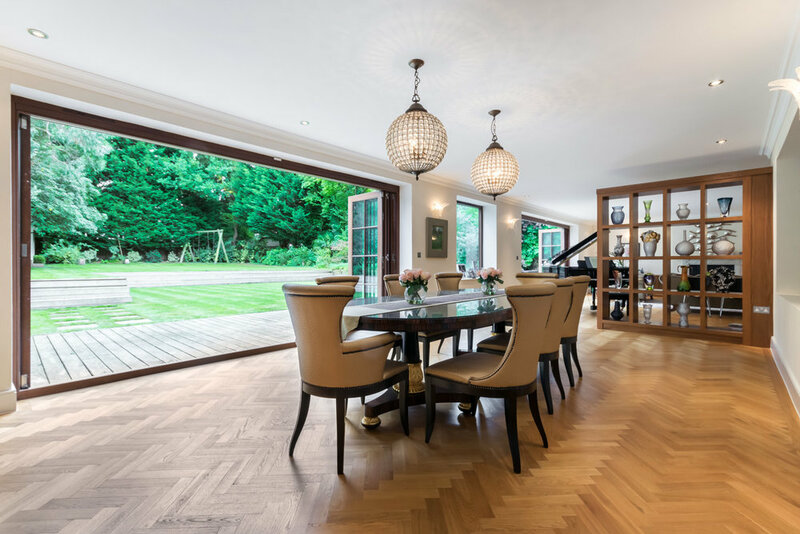 At the other end of the kitchen are located two sets of glazed French doors, opening onto the spacious front aspect family room, with herringbone Oak wood flooring and which benefits from two large windows overlooking the driveway and two skylights, making it a bright room. The second floor landing overlooks the rear garden via a set of French doors flanked by two fixed glazed panels, opening onto a balcony. With herringbone Oak wood flooring and a skylight, this leads to four of the bedrooms and also provides access to the second floor via another secondary staircase. The grand master bedroom suite offers a vast and well equipped walk in dressing area, fitted with floor to ceiling storage space comprising wardrobes and drawers, and benefitting from having a wide window with views to the front; an en suite bathroom, with a modern white suite comprising a low level WC, countertop ‘His and Hers’ wash hand basins inset into a vanity unit with medicinal cupboard above, a panelled bath and a fully tiled shower cubicle with glazed surround, and a large double aspect bedroom with further wall to wall fitted wardrobes and with French doors opening onto a balcony overlooking the rear garden. Bedroom Two is rear facing, fitted with wardrobes and benefits from views over the garden via a window and French doors opening onto a Juliet balcony. 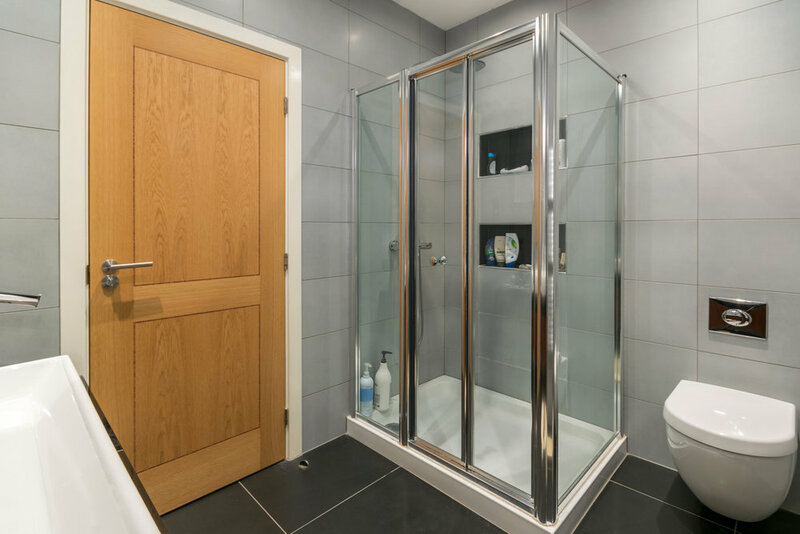 This room also has the benefit of an en suite, with tiled floor and walls, and comprising a wall mounted WC, a wash hand basin inset into a vanity unit and a corner shower cubicle with glazed surround. The other two bedrooms on this floor enjoy views over the front garden, and the family bathroom, with tiled floor and walls, comprises a wall mounted WC, a wash hand basin inset into vanity unit and a panelled bath. Bedroom Five and Six are both located on the second floor, and both benefit from three pairs of French doors leading to Juliet balconies offering views over the rear garden and beyond, and from deep walk in under the eaves storage cupboards. The laundry room is also located on this floor, and is well equipped to serve its purpose. There is a family bathroom with tiled floor and walls that serves both rooms on this floor, and it comprises a wall mounted WC, a wall mounted wash hand basin inset into vanity unit below and medicinal cupboard above and a tiled bath with glass panel. As with all wet areas in the property, this benefits from a chrome ladder rack heated towel rail and an extractor fan. Outside, the beauty of the secluded 109ft rear garden is in the simplicity of its landscape design. There is a decked patio across the full width of the property creating ample outdoor seating areas. The mainly laid to lawn garden is surrounded by mature trees and shrubs to the perimeter and there are steps halfway through leading up to the slightly elevated half of the lawn. Landscaped stepping stones lead to the summer house located at the back of the garden, which work well as an office or a granny’s annex. Equipped with an en suite shower room comprising a WC, wash hand basin and fully tiled shower cubicle as well as a kitchenette. No warranty is given concerning this property, its fittings, equipment or appliances as they have not been tested by the Vendors’ Agents. Measurements are approximate and no responsibility is taken for any error, or mis-statement in these particulars which do not constitute an offer or contract. No representation or warranty whatever is made or given either during negotiations, in particular or elsewhere. No part of this publication may be reproduced in any form without prior written permission of Coombe Residential Ltd. All rights reserved.